Birthday - Death Anniversary - Moses Norris, Jr.
Moses Norris, Jr. was a United States Representative and Senator from New Hampshire. Born in Pittsfield, he attended the public schools and the Pittsfield Academy, and graduated from Dartmouth College in 1828. He studied law, was admitted to the bar in 1832 and commenced practice in Barnstead. 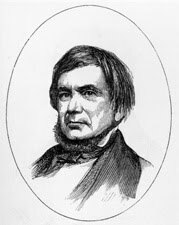 He returned to Pittsfield in 1834, was a member of the New Hampshire House of Representatives from 1837 to 1840 and in 1842, and was a member of the Executive Council of New Hampshire in 1841-1842. Norris was elected as a Democrat to the Twenty-eighth and Twenty-ninth Congresses. He was again a member of the State house of representatives in 1847-1848, and served as speaker. He was then elected to the U.S. Senate and served from March 4, 1849, until his death. While in the Senate, he was chairman of the Committee on Claims and a member of the Committee on Patents and the Patent Office and the Committee on the District of Columbia. He died in Washington, D.C. in 1855; interment was in Floral Park Cemetery, Pittsfield.